Unlike normal sponge cake, this roulade is made without butter and rolled around a filling of low-fat fromage frais rather than cream. There is some sugar here, but less in each portion than you'd find in a single can of cola. Preheat the oven to 190°C, gas mark 5. Line a 30cm x 23cm swiss roll tin with non-stick baking paper. Put the eggs and 100g sugar in a large bowl and beat with an electric whisk for about 5 minutes until thick, pale and moussey. When you lift the beaters, the mixture that drips off them should leave a trail on the surface of the mixture. If not, the mixture isn't thick enough, so keep beating. Sift the flour and cocoa again, straight into the egg mixture. Fold in gently until evenly mixed. Pour into the prepared tin and shake lightly to level. Bake for 15 minutes or until the sponge is firm to the touch. Meanwhile, lay a large piece of baking parchment over a clean tea towel and lightly dust with caster sugar. When the sponge is cooked, turn it on to the sugared paper and peel off the lining paper. Use the baking parchment to roll the sponge up (starting with one of the short sides), so the sugared paper is rolled up with the sponge, with the tea towel lying on top. Leave the sponge rolled up in this way until cool. Lightly mix the raspberries into the fromage frais. Taste and add the extra sugar if you feel it needs sweetening. 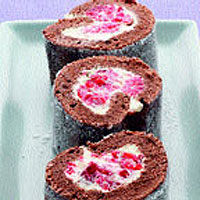 Gently unroll the sponge, spread with the raspberry mix and re-roll. Serve in slices.